The design of dairy factory is critical to its ease of operation. Pasteurised milks, UHT milks, ESL milks, drinking yogurt, cheese of various types and specialist cultured-product building require specialist knowledge of dairy processing and quality in design. The dairy industry's hygiene requirements and zoning of plants requires that internal surfaces and ledges are designed to be easily cleanable, easily maintained and hygienic in design. Many companies still use wall and floor tiles and thse can be extremely costly to install and are not a good hygienic solution due to the multiple joints which over time will crack and harbour bacteria. Simplicity is design is usually the best and if an expoxy floor is not for you then use an epoxy paint on the fllor or a very hard concrete floor with a float finish. Insufficient care is taken by many when designing dairy floors and these are usually left to the architect and very often they get it wrong due to a lack of first hand experience. The exterior of the plant is also important to the hygienic design of the factory The design specification, and routing of piping, pumps, valves, and equipment is critical to the ease of operation and also the cost of installation. Design the utilities to optimise the flows of utilities and reduce pipe runs. Position the utilities closeest to the main consumers and reduce cost and wastage. All plant need to be capable of being cleaned-in-place (CIP) and there is usually a high and low risk segregation of CIP units, with one allocated for raw milk and one for pasteurised milks. Most countries need to work to standards and the UK works to British and European standards and for export to the USA need to design to meet the USDA 3A standards. The manufacturing rooms for pasteurised products are kept seperate from cultured products due to the risk of cross contamination. DAiry walls, floors, ceilings, electrical installations and drains mustbe water and chemical resistant. The environment is usually protected by positive pressure hepa filtered air with the air flowing from high risk areas to lower risk areas. Many factories take account of air conditioning but many fail to plan properly for ventilation and the measuring and balancing of air pressures which are aprticularly critical with Infant formula production. It is critical that your chosen dairy consultant establishes exactly what you wish to produce as leaving out a single product size of variant can add millions of dollars to the cost of the plant. What Dairy products do you wish to produce? How much of each Dairy product do you wish to produce? Who is your preferred packaging type supplier; tetrapak,elopack,combiblock etc? 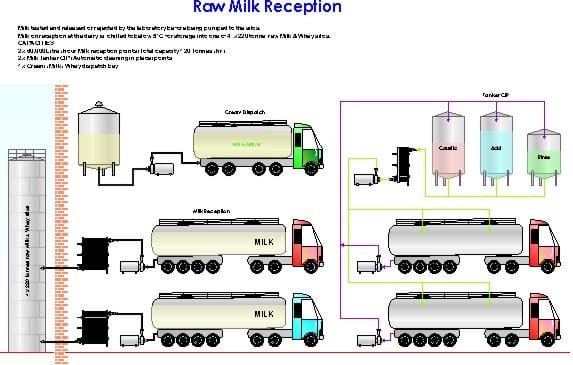 What is the availability of raw milk for processing? 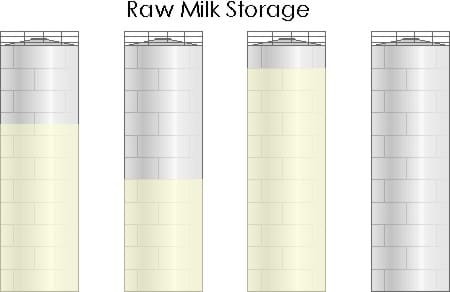 What is the Micronial Quality of your raw milk supply. Do you require a Dairy business plan to raise finance? Do you want to use new or used Dairy plant equipment or a combination of both? Do you plan a Dairy Waste Water Treatment Plant? Are there any site / ;ocation restrictions? Is there sufficient Electricity available for Dairy Processing? Do you require a consultant to assist from commencement? THE RAW MATERIAL - MILK COMPOSITION - Cow's milk? What is your chosen capacity? Pumps - pay particular attention to design to minimize mechanical damage to milk and calculate flow rates through pipes taking account the required CIP flow rate as well as recommended rate for milk flow. Air elimination - use an automatic air bleed to avoid cavitation and extended time in connecting tankers particularly with many small tankers. Pumps should have sufficient head of milk with auto level control on / off to save energy, avoid damage to milk and save time. Sampling - auto samplers are preferred but provision should be made for hygienic dippers, mixing plungers and also plastic disposable dippers and containers, consider on tanker auto samplers with bar coded labels. Weighing - It is essential in large volume plants to have a reliable weighbridge and this can be cross referenced with the flow meters, normally milk payment is made based upon weighbridge weights and laboratory results. Milk software - essential in large plants to ensure you pay the producers on time and for their milk supply where contracts can be quite complex and often deliberately to make it more difficult for producers to assess between manufacturers, i.e. fat and snf premiums and penalties vary as do hygienic quality and water addition etc. Pipe insulation - consider potential condensation and temperature issues if the area is exposed to sunlight as milk pipes can heat up rapidly. Floor finishes - Depends on your budget - do it properly and avoid tiles - if budget is tight then use a hardened concrete. Security access - Air lock or fan and combination locks or card or fingerprint access - budget to consider but this helps with control of staff by area. Quarantine - is a quarantine tank required, which country is this? Hose handling and storage - hoses can be heavy and cumbersome and should be easily handled by 1 person and secured after use - use a simple lifting balanced system. Detailed consideration is also required for each of the other areas. Complete clarity at this stage ensures a smooth running project, if you do not go into detail at this stage then issues will be raised later and may cause costly delays and changes. Optimise your design for ease of operation, ideally use a consultant who has extensively operated and managed dairy plants and ideally has designed, project managed and built a few as they will have already made their mistakes and you will get the benefit of this experience and not learn by your experience. To build a new factory on a green field site in "location"